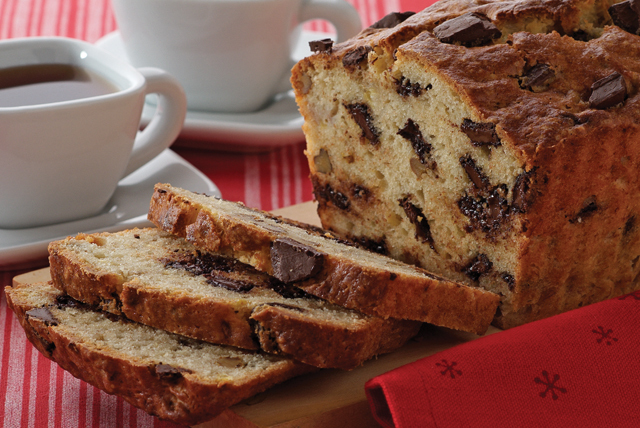 This mix delivers an inspired twist on sweet, moist banana bread that'll go gangbusters at the bake sale. Or wrap up the mix as a gift. Place ingredients in 1-gal. resealable plastic bag; seal bag. Place bag in disposable 9x5-inch foil loaf pan, then place in decorative gift bag. Store at room temperature until ready to prepare or give as a gift. Whisk eggs, oil and milk in large bowl until blended. Stir in bananas. Add Bread Mix; stir just until moistened. Spray foil loaf pan with cooking spray; fill with batter. Bake 55 min. or until toothpick inserted in center comes out clean. Cool completely. Be sure to include a tag with the Bread Mix listing both the additional ingredients needed, and the mixing and baking directions. Pack the wrapped bread mix along with some colorful tea towels for a great hostess gift.